OK there really isn’t much sleuthing going on but with a sly Professor Moriarty (Jared Harris) as your villain with an ambition to set Europe ablaze so he can make a fortune selling guns, it’s like a panto version of Lord of War. 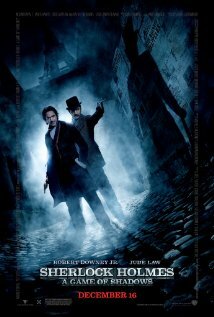 The look and feel of Victorian London is done well (as in the first film) and is wonderfully convincing. Jude Law makes a good foil as Watson, Downey an excellent panto dame – only Noomi Rapace as the gypsy girl doesn’t really get that much to do. The stylistic tricks can be a tad distracting as Sherlock plans his moves and the slow mo is a trifle overdone, but overall there is a genuine enthusiasm to entertain here and a great Hans Zimmer soundtrack to underscore the pace (worth getting in its own right). Throwing Dr Watson’s new bride from the train was a great surprise and not something Sir Arthur Conan Doyle would ever do to a lady – but then again this is a different kind of Sherlock Holmes and ladies it turns out are a lot tougher than some Victorians believed. Avert your eyes when the great white whale Stephen Fry (as Mycroft) wanders in naked, but do go to see this. You will find more laughs in this mystery than almost any comedy coming out of Hollywood these days. And take the kids. Sticklers for history might wonder where the man with the red flag was who is supposed to walk in front of the motor vehicle at 4mph in case it frightens ladies and horses (in force till 1896) but hey it would only be a walk on part right? Downey is held with great affection in the UK and does not let us down. (Such a pity Ms Adler disappears so quickly however.) When we reach Switzerland and the terrifying fortress hanging from the mountain cliffs there is only one question. Will Holmes survive the Reichenbach falls?